The key to efficiency calculations in Angle is the reference efficiency curve (REC). In order to calculate the detection efficiency for a given counting arrangement, some experimental measurements must be performed. These measurements are used as reference ones for future calculations. The complete counting arrangement for the reference measurements must be defined as a part of the reference efficiency curve data, including detector, source, container and geometry used. Obtaining reliable reference efficiency curve is crucial for successful Angle utilization: all Angle results for a given detector will be relative to REC with an error propagation factor = 1; that is to say 100% of the uncertainty in the REC is added to the uncertainty budget of the calculated efficiencies. Investing time and care in determining the REC will always pay off! You can define the reference efficiency curve by using the button “Edit curve” on the “Additional parameters” tab on the ribbon, or you can turn it off using the “No curve” button. If the reference efficiency curve is not specified, efficiencies will not (cannot) be calculated! Only effective solid angles will be calculated in this case. Another, more flexible way, to work with reference efficiency curves is by using the pop-up menu, which you can open by clicking the “Reference efficiency curve” label in the Additional parameters group of the main window. You can use the first option from the pop-up menu (“Edit curve...”) to specify a new curve, or to change an existing one. The second option (“No curve”) turns off the reference curve from subsequent calculations. The reference efficiency curve pop-up menu contains two additional options. One is “Load saved curve...” which opens a dialog to select a reference efficiency curve file to load. The other one named “Saved curves” opens a sub-menu with a list of all the saved reference efficiency curves, from which you can select any previously saved one with just one click. The “Saved curve” sub-menu is automatically populated with all saved reference efficiency curve files from the default folder. Reference curve name and description. To create a new reference efficiency curve, click the “New curve” button. After this, the form will be cleared and you will be able to enter the data for a new curve. With the “Load saved curve” button, you can load the previously saved reference efficiency curve. You can also load the curve from files with saved calculation parameters or calculation results. You just need to choose the appropriate file type in the file selection dialog. The most important data for each reference efficiency curve is the set of experimental points, i.e. the list of energy-efficiency pairs. You need to specify the number of points and the value pairs for each of them. The points will be automatically displayed on the log-log diagram in the right-hand part of the window. Experimental points can be easily transferred from another application simply by copying the values there and pasting it using the “Paste from Clipboard” button. Vice versa, you can copy the values to another application by clicking the “Copy to Clipboard” button. In order to be able to calculate the efficiencies for any energy, not only those defined with the experimental points, Angle also needs to create a reference efficiency curve fitted through these experimental points. So as to create the best fit possible, you can divide the interpolation into intervals, each of which can be of different polynomial orders. The intervals are defined by energy pairs (in keV) and polynomial order for that interval. These intervals are represented on the diagram with dashed green lines. When interpolating the reference efficiency curve, Angle takes the closest point from the neighboring intervals in order to create a smoother curve. Polynomial orders can have values from 0 to 6. Value “1” represents a linear fit, “2” is a quadratic fit, etc. If you enter the value “0” for the polynomial order, no interpolation will be used –points will be connected with straight lines (in the log-log space). Although Angle supports polynomial fitting up to an order of 6, it is recommendable to divide the energy region of interest into several segments and fit each of them with polynomials of a lower order (not more than an order of 3). If you do not specify interpolation regions (i.e. if you enter “0” as the number of regions), interpolation will not be used. This way, you will define a “discrete curve” – you will be still able to run calculations, but efficiencies will be calculated only for the energies which exist in the experimental points. This approach have some advantages; in cases when all energies of interest for calculation have their counterparts in the experimental points, exact efficiency values will be used, instead of interpolated ones, leading to better accuracy (again, only for given energies). Discrete REC is particularly suitable for scintillation detectors, where often only one or a few gamma-energies are recorded in the spectrum. Next, you need to select the detector which was used for reference efficiency curve measurements. This parameter is used as a control parameter, to prevent running calculations using some other detector (of course, REC and calculated efficiencies must be for the same detector!). One REC per detector is enough, in principle. It is recommended to construct it by counting a number of calibrated point sources at a large distance from the detector (e.g. 20–30 cm), avoiding any true coincidences and matrix effects. Also, absolutely calibrated point sources are often certified to better accuracy than voluminous ones. It is generally more prudent to use several single-nuclide sources, than a single multi-nuclide one. However, in order to additionally exploit the ET error-compensation effect, one might consider constructing more RECs for the same detector. For instance, the same point source(s) counted at large distance could also be counted on the detector top, yielding another REC. Calibrated cylindrical and Marinelli sources could produce additional RECs. During exploitation, choosing REC geometry similar to the actual sample geometry should eventually produce better (more accurate) results – due to a larger ET error-compensation. 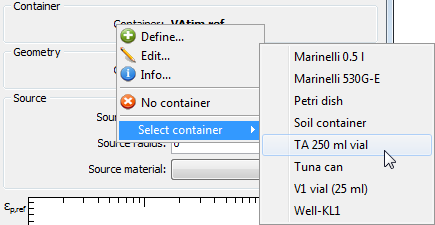 The next step is to define the container and geometry which were used for reference measurements. It is possible to define a new container/geometry, or to choose one of already defined containers/geometries. For Well detectors, reference geometry can make use of a source holder (e.g. for point sources). Nevertheless, reference calibration is best with source placed in the well, as will also be the case with the samples. Finally, the radioactive source used for efficiency measurement has to be defined: its height, radius and material. When you complete data entry and confirm it by clicking the “OK” button, you can choose whether the curve data will be saved to file or not. We strongly suggest you to save the curve for future reference. If you do not save it, you will still be able to use it for calculations, but only until you load another curve or select the “No curve” option. After that, all parameters will be lost, and you will have to re-enter them, if needed. 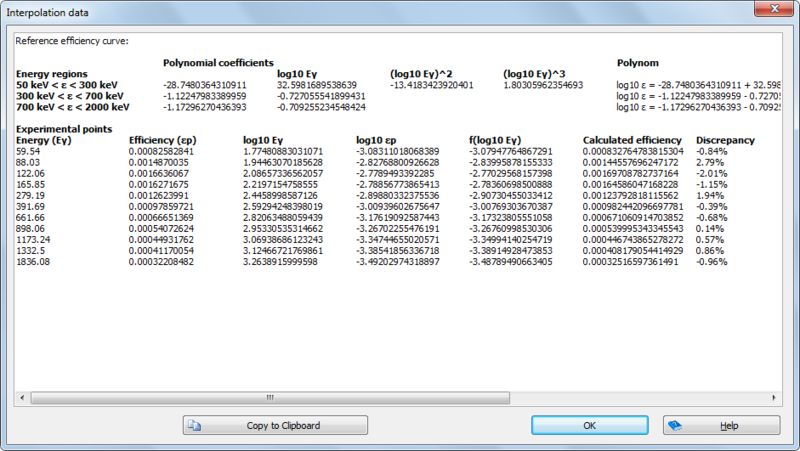 In Angle 4 it is possible to see the calculated polynomial coefficients and other interpolation parameters. To see this, click on the “Interpolation data” button in the “Energy regions” group. You can select and copy parts of the data to another application, or click on “Copy to Clipboard” button and copy all at once. A reference efficiency curve can be imported directly from ORTEC’s GammaVision software by clicking the “Import from ORTEC GammaVision” button and choosing the GammaVision file containing curve data (“.eft” extension). ORTEC GammaVision files do not contain information about the detector, container, geometry or source. You have to specify them manually, after the import. 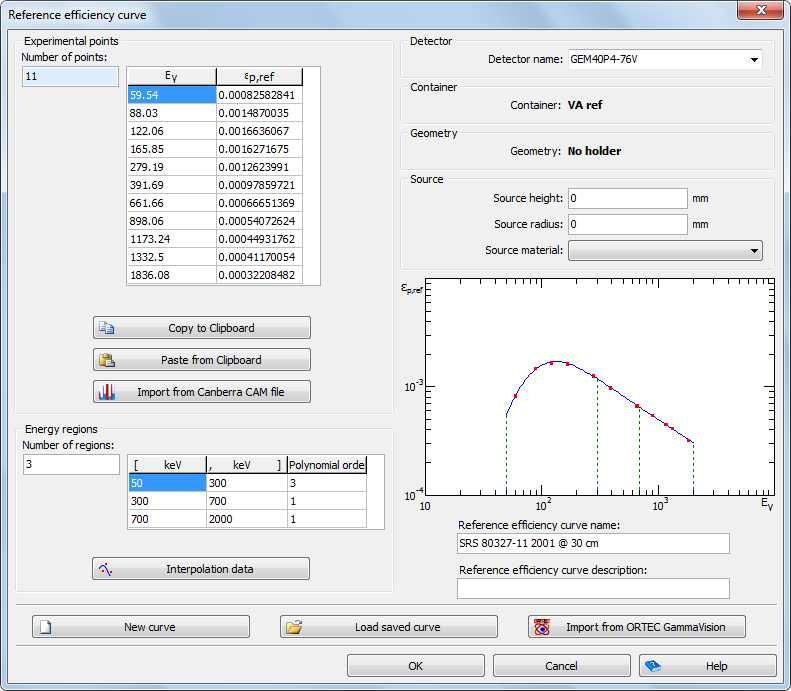 The experimental points for a reference efficiency curve can also be imported from Canberra’s CAM files by clicking the “Import from Canberra CAM file” button and choosing the Canberra CAM file containing experimental points data (“.cnf” extension). Canberra CAM files contain experimental points data, only. Other parameters must be specified manually. Canberra software must be installed on your computer in order to be able to import CAM files into Angle.